Although mostly associated with the modernist movement he was interestingly enough known for several major artistic styles and created art in many different formats painting, book illustrations, stage sets, ceramic, tapestries art prints notwithstanding. A prolific and amazing artist known for his exquisite used of color, Marc Chagall was also, as it happens a prolific stained glass artist. In fact, Marc Chagall’s stained glass windows are known and loved worldwide for their beauty. Interestingly enough Chagall didn’t start working in stained glass until his 70’s–which is incredible considering the breadth and talent of his stained glass work. 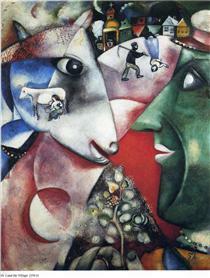 But it is also no surprise either because Chagall, in all of his artwork, was so very in tune with light and color. This attention to where light would shine through his stained glass windows paired with the clever exploitation of glass properties to extract the most amazing colors–were the ingredients to his overwhelming success. Chagall did a number of church stained glass windows, in fact, he did many stained glass windows in Europe–France in particular, commissioned by quite a few churches internationally. However, his artistry was not relegated to just churches. Although he did a wide array of church stained glass window, rich with religious iconography, he did many more “secular” windows too. Some of those windows he did for and still are here in the United States. The series is called “America Windows” and can be viewed at the The Art Institute of Chicago. These windows are prized American art treasures as you can see by the video below. Chigall Stained Glass In America from Denver Stained Glass on Vimeo. 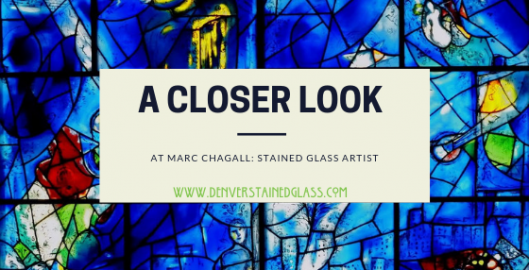 Here at Denver Stained Glass have a deep passion for stained glass and stained glass masters like Marc Chagall inspire both our church and home stained glass work and restoration. For more information on what we do or if you have stained glass questions, reach out to us today! Interested in Some Denver Stained Glass? Meet our Company? Scottish Stained Glass has appeared on local and national television dozens of times, explaining where and how stained glass can make a beautiful and elegant addition to your Denver home.